The Activity Feed is a complete history of your school's interaction with this person. It includes notes, emails, letters, files, to-dos, and other items involving the person you're looking at. What you see in the feed depends on your user roles. Each item in the feed has visibility settings based on user roles. 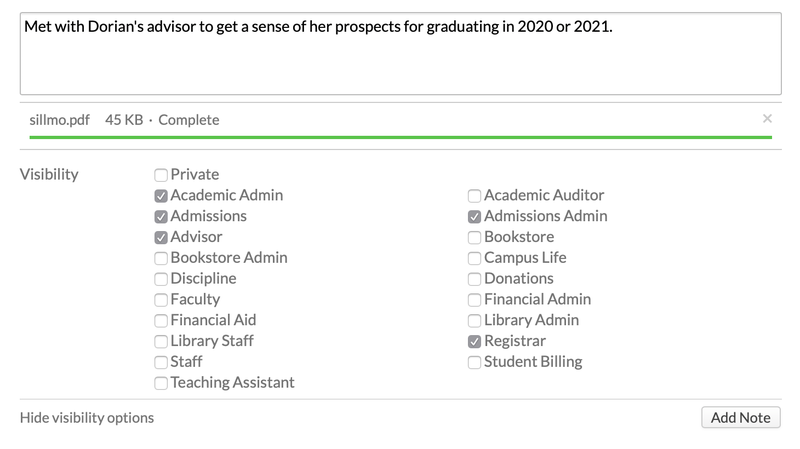 So, if you're a Financial Admin, you won't see items marked for Faculty (unless you also have that role). Use the filter drop-downs to sift the feed for certain kinds of events—say, Files added by John Adams. Select Changes in the filter to see a complete list of events that have affected this person. It includes items like course registrations, password changes, info updates, and so on. It does not contain specific course events—for that, you'll need to look at Course > Reporting > Changes. What kind of stuff is on the activity feed? Emails, printed letters, and to-dos—whether one-off or as part of a communication plan or mailing list. Notes and files you and others manually add (see below). Admissions events: inquiries, responses, application starts, and application questions/responses. 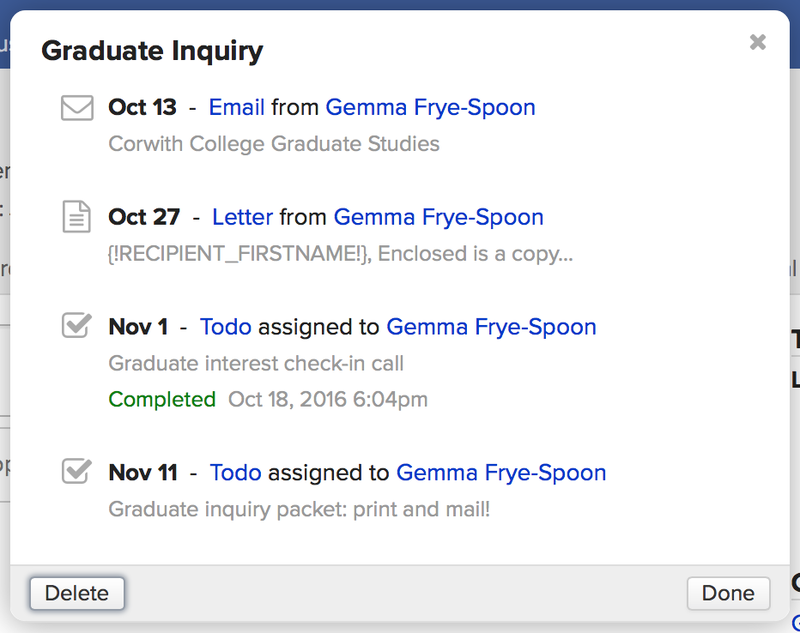 If you email someone from within Populi, that email will appear on their activity feed. If you email someone outside of Populi—say, from GMail or Outlook or Apple Mail, etc.—the email will appear on the feed if 1. you BCC your Populi dropbox and 2. the person's email address is listed in his Profile > Info view. Basic event details: what the item was, when it was sent or completed, and by whom. The content of the item—the text of the communication or the to-do, for example. Any files that were attached to the item. The visibility of the item. Which user roles can see this? To see an item, a user must have one of the roles that's listed. Type or copy-paste your note into the text area. You can use text formatting in these notes. If you'd like to attach a file, upload it manually or use the drag-and-drop interface. You can add a note without attaching a file; likewise you can attach a file without leaving a note. Click Show visibility options. Check the roles to which you'd like to give access to this item. If you skip this step, the item's visibility will be set to Private—only you will be able to see it! (unless you've specified otherwise in your personal settings). When you're done, click Add Note. Now that you've added the note and/or file, it will take its place in the activity feed. If you need to make changes, hover over it and click edit to update it or to delete it. To-dos shows the tasks regarding this person. For example, you might add a donor to a communication plan that includes a few to-dos. Those to-dos would appear on the donor's activity feed (as opposed to those you would see on your Home page, which are assigned to you). So, a to-do on John's profile assigned to Gemma would mean: Gemma, check in with John about next year. If you don't see a linked name next to the to-do, that means it's assigned to you! Read more about adding and editing to-dos. Communication plans lets you manage which communication plans are applied to the person. Scheduled communications shows you the emails and letters scheduled to be sent to the person as a result of the plan(s) applied to him. If you see a letter or email here, it has not yet been sent! Emails are sent on 7 AM of the day the event occurs. Select a plan from the drop-down. You can add as many communication plans to a person as you wish. Now that you've added this plan, its events are added to the To-dos panel and Scheduled Communications (you can also find them in the report of the same name). 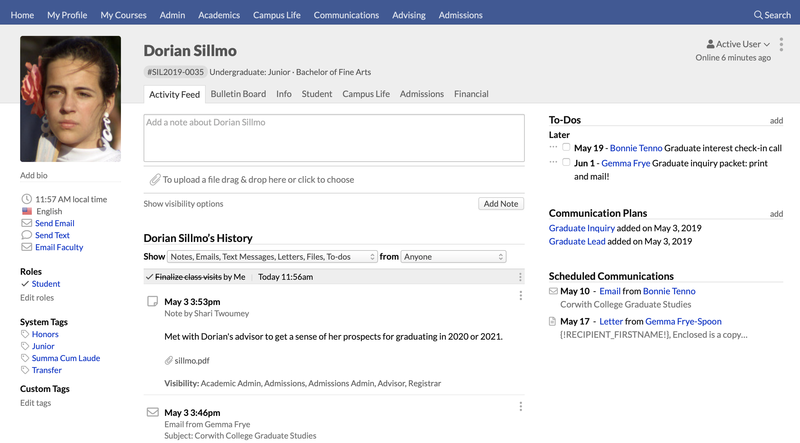 Click the communication plan's name to see all of its events. Click an individual event to edit it. Or click Delete to remove the plan and all events from the person. You can also click the event under Scheduled Communications to edit it.